As my company, Cosign has grown into a vertical solution provider, our customers are unique in that they require very high quality output on many different display types, including flat panel, outdoor LED, projection, and very small chassis displays. Reliability is also a major concern for our customers, as their content often falls under the rules of government regulators. With the release of version 3, Infocaster has become a robust, enterprise-level digital signage solution that meets the needs of our high-end clientele in the gaming and corporate space. We would like to have had web access to the Network Manager component of Infocaster, but Harris promised us it was still under development. We just recently attended a Harris webinar that showcased the new web-enabled Network Manager, and we are impressed. We manage the digital signage network for World Market Center in Las Vegas - the world's largest market specifically for the furniture trade. World Market Center wanted a solution that was industry tested and supported by a reliable company that would "be there" years later. 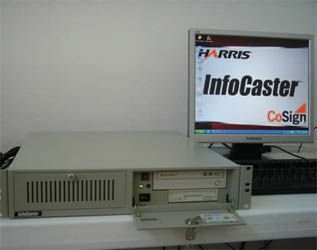 Harris Infocaster was specified because it is based on its broadcast-industry-standard graphic technologies. It was our first and only choice because it exceeded our requirements and because we knew we could rely on Harris to be around through the project's completion date of 2012 and beyond. Infocaster has performed very well. Harris' approach to graphics, using layers rather than frames, works well for our creative team because their experience is broadcast video production. Infocaster comes with Titlemotion, a great tool for graphics, text, and motion effects, which we use extensively. The output is extraordinary. Infocaster's workflow is excellent. We manage client systems from two offices in Sioux Falls, SD and Las Vegas, NV, and also onsite at the World Market Center. The process is easily managed regardless of location. All content resides on the Infocaster Network Manager server, and our people at any of these control locations can create and modify content, schedules, and update players. It's fast, reliable, and secure. Harris has been there to support us as well. When we had a player with output problems, support did not hesitate to replace the entire unit. We know, at the end of the day, that Harris has our backs and that helps us sleep...and I can't think of anything more important in a supplier. Robert Garity is vice president of sales and marketing for Cosign, a Henderson, NV-based provider of digital signage systems. Last week, Josie missed a field trip that her botany class took to the Botanical Garden. Today, using a technology called Augmented Reality (AR), she's going to make up that field trip on her own using a guided tour that the TA created to help her understand the material the class covered. The midterm is coming up, and Josie will need to identify key species in each of nine ecosystems modeled in the garden. Josie heads to the Botanical Garden with her PDA. Starting from the main gate, she faces east and observes a striking cedar, in front of which is a sign that tells her the tree is more than 500 years old. Josie plugs in her headphones and selects a recording of the professor giving his theory about the role that trees like this one play in the ecosystem. As she approaches the cedar, the GPS in her PDA notes her location and makes the appropriate files available. Browsing through the notes associated with her current GPS coordinates, Josie discovers that a classmate has decided to do his term project on the skunks making their home in the tree. She also learns from a previous year's student project that the skunks living in the tree displaced a young raccoon. As she moves through the garden, she selects photos and movies of other trees, depicting the history of the garden, seasonal differences, and changes that have occurred. In addition to the material supplied by the TA, Josie is able to download the notes, photos, and keywords that the rest of her class recorded when they took the field trip. She adds her own observations, assigning appropriate keywords so others can find them easily. She also makes sure to include GPS coordinates. When she is finished with the project, she will include it in her public record to share with her little brother back home. The goal of AR is to add information and meaning to a real object or place. Unlike virtual reality, AR does not create a simulation of reality. Instead, it takes a real object or space as the foundation and incorporates technologies that add contextual data to deepen a person's understanding of the subject. For example, by superimposing imaging data from an MRI onto a patient's body, AR can help a surgeon pinpoint a tumor that is to be removed. Augmented reality has been put to use in a number of fields, including medical imaging, where doctors can access data about patients; aviation, where tools show pilots important data about the landscape they are viewing; training, in which technology provides students or technicians with necessary data about specific objects they are working with; and in museums, where artifacts can be tagged with information such as the artifact's historical context or where it was discovered. A range of technologies can be used for AR. Many projects use headgear or a similar device that projects data into the user's field of vision, corresponding with a real object or space that the user is observing. In the case of a technical course on PC maintenance, for example, AR might overlay a schematic diagram onto the inside of a computer, allowing students to identify the various components and access technical specifications about them. PDAs or other portable devices can use GPS data to provide users with context - including visual, audio, or text-based data - about real objects or places. AR is not merely a companion text or multimedia file, but a technology designed to "see" a real object or place and provide the user with appropriate information at the right time. It's designed to blur the line between the reality the user is experiencing and the content provided by technology.